Emerald is the green member beryl family. Other beryl family members are include Aquamarine, Heliodor and Morganite. Emerald's green color comes from trace amounts of chromium and sometimes vanadium. 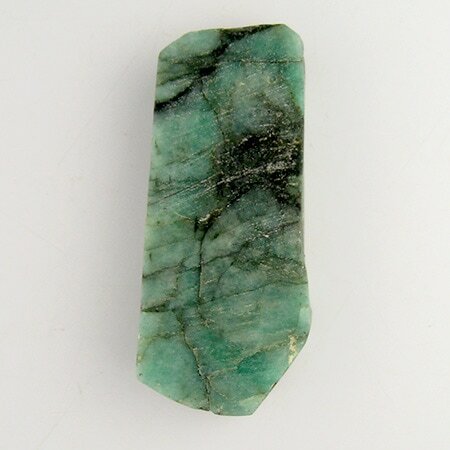 Only gemstones that are medium to dark in color are called emeralds; lighter tones are called green beryl. ​Emeralds tend to have numerous inclusions and fissures which are sometimes described as "jardin" French for garden. Because of these inclusions and fissures, most emeralds are treated to improve their clarity and stability. ​The first known emerald mines were in Egypt, dating from about 330 BC. Cleopatra was passionate about emeralds and used them in her royal adornments. ​By the time Spanish explorers arrived in what is now Columbia, the Incas had used emeralds in the jewelry and in religious ceremonies for over 500 years. Emerald is the sacred stone of the goddess Venus. It is thought to preserve love. It is also the symbol of hope. ​Emerald is the birthstone for the month of May.